We really love the fireplaces. They are beautiful. We were extremely excited to see what you have done with them, as we also have an old coal burning fireplace and would like to replace it with a Valor insert (Senator model), similar to the President one you used. We are having difficulty finding a decent framing plate that will cover our existing opening (24 inches wide, 30 inches tall) and were excited to see the framing plates shown behind the President mantel in your pictures. Are the framing plates you show a Valor product or another brand ? Can you tell us how to reach the manufacturer? Are they available in Canada ? Does the manufacturer have a website? Honestly, my guys at Warm Solutions here in San Francisco took care of all that for me. I would say find an authorized Valor installed in your area and chat with them. Hopefully there’s more than one and you will have more options. Good luck with your project! I’d love to see some pictures when its done. Your project is turning out beautiful. I’m glad to hear you found a solution for the old fireplaces. I’m looking to add heat back in my coal-fire burning fireplace. I’m curious about the Carrera marble mantle you installed? Any resources for that? 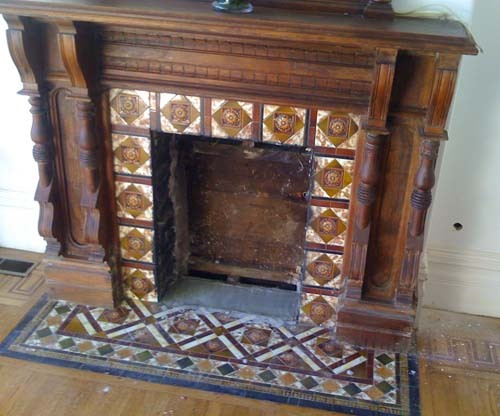 Hi, I have the exact same fire place mantel as shown in the very top pic in my 1902 Victorian in Downtown San Jose…..The chemney is in excelent shape and I would like to use the fireplace but not sure who to contact or where to get an insert? Thanks for your time but if you know anything please let me know…..